Okay, let’s be honest with ourselves and one another for a few minutes, shall we? You and I have a better chance of winning the tag titles this Sunday than either Los Matadores or The New Day. Both teams, while talented, are simply not over. Even the markiest of marks in the crowd see them for exactly what they are– weak gimmicks with a short shelf life. The fact that Los Matadores have been allowed to look like a competent threat over the last few weeks is all you need to know that they have no chance of sniffing victory in Santa Clara. The Usos would be a safe bet in most situations, especially to start the show with a big babyface pop and celebration, but Jey’s shoulder injury pretty much guarantees he’s due for some time off. There’s only one real outcome here, and it’s pretty obvious. 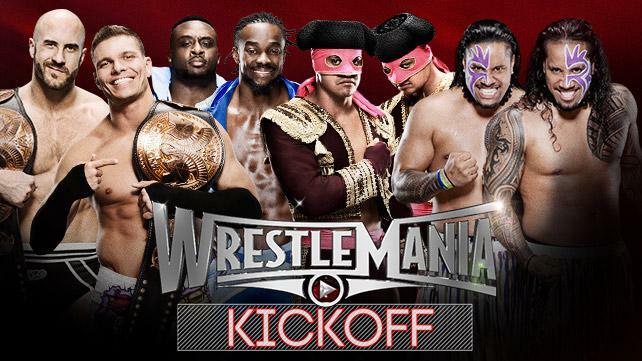 I’ll be angry if: Los Matadores or The New Day ruin a perfectly good match by winning the tag team titles, since either team holding the gold is a big step backwards for the titles themselves. I’ll keep my cool if: Cesaro and Kidd retain, in what should be a pretty solid match. I’d be okay with an Uso win, but I think everyone wins if the titles stay on the reigning and defending champions instead. Rich Guleksen liked this on Facebook.